To Cite: Ghasemi M, Rejeh N, Heravi-Karimooi M, Tadrisi S D, Samady Kia P. The Effectiveness of Foot Reflexology in the Severity of Restless Legs Syndrome in Female Patients Undergoing Dialysis: A Randomized Controlled Trial, Crit Care Nurs J. 2018 ; 11(2):e68945. doi: 10.5812/ccn.68945. Methods: A randomized controlled trial with a before-and-after design was conducted in hemodialysis patients attending a hospital in an urban area of Iran in 2016. Using a random sampling method, 72 female patients were divided into the experimental and placebo groups (n = 36 in each group). The patients in the experimental group received foot reflexology. In the placebo group, simple foot reflexology without pressing certain parts of the foot was conducted. The restless leg syndrome questionnaire was used to measure the severity of restless leg syndrome before and after the intervention. Statistical analysis was performed using SPSS v. 21 software. Results: After the intervention, the score of restless leg syndrome in the experimental group reduced compared to the placebo group (P = 0.02), while the group score of restless leg syndrome showed no statistically significant difference between the experimental and placebo groups (P = 0.84). Patients with kidney disease undergoing hemodialysis often suffer from some physical complications including restless leg syndrome (RLS) (1). RLS is a sensorimotor disorder that is accompanied by an uncomfortable sensation of paresthesia and involuntary and continuous movement of legs. The signs of RLS are aggregated during the periods of rest and lack of activity and are relieved by moving the involved leg (2, 3). Approximately, 20% - 30% of patients with hemodialysis experience RLS (4) while the prevalence of RLS is 2% - 15% in the general population (5). Patients with RLS usually experience several complications including problems with doing daily tasks and sleep deprivation, excessive daytime sleepiness, chronic insomnia, daytime drowsiness, fatigue during the day, stress, anxiety, depression, driving problems, and disruption of the social activities and family life, which can impair the quality of life (3, 6). Moreover, RLS may cause problems with the dialysis process (7). There are four main clinical criteria for the diagnosis of RLS according to the international restless leg syndrome study group (IRLSSG) including: 1, an urge to move legs that is usually associated with paresthesia; 2, alleviation of the symptoms by moving the legs; 3, aggravation or exacerbation of the symptoms particularly at rest or during sitting or lying down in the bed; and 4, worsening of the signs at night (8, 9). The etiology of RLS is yet unknown. Some pharmacological and non-pharmacological therapies are commonly applied for the treatment of RLS (10, 11). As suggested by reports, of 80% of patients with RLS who seek medical attention, only 25% are properly diagnosed. In addition, only 13% receive effective medications (12). Consumed drugs are excreted through kidneys that can increase the patients’ problems. Therefore, non-pharmacological treatments seem essential for such patients. Due to several side effects of pharmacological treatments, many patients prefer non-pharmacological methods (13). Non-pharmacological methods are increasingly being applied to the management of RLS (14). Pharmacological treatments have their own side effects alongside the reduction of the severity of RLS. One of these methods is minor to moderate activity of limbs (15). Reflexology or foot reflex zone massage is an ancient practice (16). Reflexology as the stimulation of some parts of the feet and hands associated with various organs is based on the Ingham method of reflexology (17). Reflexology provokes the chemical system of nerves, balances enzymes, and regulates the endocrine function (18). Reflexology aims to achieve free energy flow in different organs associated with pressure points. Thus, it aids the body with self-improvements (19). In studies conducted on patients with kidney disease undergoing hemodialysis, reflexology has shown to be effective in cramps (20). The non-pharmacological treatments of RLS have exhibited temporary and effective relief of symptoms. More research is required on the effectiveness of non-pharmacological treatments in RLS. Thus, this research aimed to investigate the effect of foot reflexology as a non-pharmacological treatment on the severity of RLS symptoms in patients undergoing hemodialysis. This was a single-blind randomized controlled trial. This study was done at a high volume hemodialysis center with 48 hemodialysis beds at a hospital in an urban area of Iran from October 2016 to April 2017. All female patients undergoing hemodialysis with any etiology of renal failure were evaluated for RLS and 72 female patients were selected using a convenience sampling method. They were randomly allocated to either the experimental or placebo group (n = 36 in each group). The inclusion criteria included: (a) diagnosis of RLS by a physician (the presence of four criteria of the International RLS study group (IRLSSG) confirmed by the physician); (b) the desire to participate in the study; (c) age at least 18 years (d) starting hemodialysis at least 6 months before; (e) weekly dialysis three times a week and each time for 3 - 4 hours; (f) having no disability; (g) having complete awareness; (h) ability to walk on feet; (i) no fever, bleeding, thrombosis, infection, injuries, ulcers numbness, or paralysis of legs; (j) lack of peripheral neuropathy or vascular problems in legs; (k) no history of drug addiction and; (l) not receiving treatments within two days before the foot reflexology. Exclusion criteria were: 1, refusal to complete the intervention sessions; 2, any hemodynamic instability during the intervention; and 3, the need for special treatments determined by the physician. Given the results of a previous study (21), the sample was estimated to include 33 patients for each group. However, 36 patients were recruited for each group considering the possible dropout rate (possible attrition) for interventional studies. Therefore, the sample size was finalized as 72 patients. After the screening of all female patients undergoing hemodialysis for RLS, 70 patients were selected. The patients were selected using the blocking randomized method and via opaque sealed letters containing all possible arrangements of samples in each block. Each block consisted of four patients (Figure 1). The participants were blinded to the study and were not informed about their group random allocation. All data collectors, who handled the questionnaires, and the personnel, who performed the dialysis, were blinded to the study allocation of the participants. In addition, the data analyst was unaware of the group assignment. Data were collected using a personal and medical information form that included items such as age, education level, marital status, job status, smoking status, history of the disease, history of RLS in the family, and duration of receiving hemodialysis treatment. The international restless legs syndrome study group (IRLSSG) questionnaire was also employed to evaluate the severity of RLS consisting of ten questions on a five-point scale from zero to four. The total score was between zero and 40. The higher the score, the greater the RLS severity. The patients with a score less than 10 were considered mild, 11 - 20 considered moderate, 21 - 30 considered severe, and above 31 considered very severe. To assess the reliability of the IRLSSG questionnaire, the Cornbrash’s alpha coefficient was calculated and reported as 0.97. Content validity index of the IRLSSG questionnaire was also reported as 0.87 (12, 22). After obtaining the permission to enter the hemodialysis center, the head nurse in the center was explained about the study’s aim and inclusion criteria. The first researcher (MGH), who was female and qualified to administer the foot reflexology, performed the intervention in different work shifts. The intervention time was adjusted according to the patients’ routine hemodialysis sessions. Foot reflexology was performed three times a week for four weeks. At the beginning of the sessions, the investigator applied a general massage with almond oil performed on each foot for relaxing techniques (5 minutes). In each session, reflexology was used for thirty minutes. Relaxing techniques comprised a forth and back movement of the therapist’s hands on the exterior edges of the patient’s metatarsals, and an ankle loosening technique in which the therapist’s hands were applied to reflex the exterior edges of the patient’s ankles. In conclusion, pressing techniques used consisted of rubbing, finger pressing, thumb pressing, firmly press, and palpation. The pressure force was adjusted according to the patient’s tolerance. We allowed seven minutes for reflexing the parts of the feet corresponding to the points of participants’ self-reported unpleasant sensations. Moreover, foot reflexology was used on the zones including hypophysis, thyroid, parathyroid, pancreas, adrenal glands, and solar plexus zones on the feet to manage the signs of unpleasant sensations. In addition, repeated relaxing techniques were administered at the end of the sessions. During the reflexology application, the patient’s position was semi fowler. Feet were positioned at the chest level of the therapist. In the placebo group, in other parts of the foot massage points, massage was applied besides routine care during hemodialysis. Finally, data were collected and recorded eight weeks after the intervention. The research protocol was confirmed by the Shahed University (grant no. IR. Shahed. REC.1395.117). Every patient signed an informed consent form before the study. The signs were applied to identify the patients in order to observe their anonymity and confidentiality of data. This research was carried out under the supervision of a nephrologist in the hemodialysis. The proposal of the research was registered in the Iranian registry of clinical trials (Code: IRCT201612067529N11). The coded data were analyzed using SPSS v. 21. After data gathering, the data analysis was performed using descriptive and inferential statistics. The t-test was used to evaluate RLS scores in each group before and after the intervention. The Kolmogorov-Smirnov test was used to assess the normal distribution of variables. The level of statistical significance was considered at P < 0.05. It was noted that two patients were excluded due to the lack of cooperation. One patient was excluded from the experimental group because of not following the study. One patient was excluded from the placebo group because of lack of cooperation. Finally, 70 female patients eligible for inclusion in this research were approached. No harm or side effects occurred throughout the trial. The mean age of the patients was 50.47(8.86). No statistically significant differences were observed between the two groups in items of demographic variables (P < 0.05) (Table 1). Before the intervention, the mean scores of RLS were not significantly different between the two groups (20.43 (4.56) vs. 20.54 (4.38), P = 3.07, P = 0.48, respectively) (Table 2). However, after the intervention, the mean RLS score significantly reduced in the experimental group, while this score remained relatively unchanged in the placebo group (19.77(3.04) vs. 18.26 (4.91), P = 0.02). According to the Cramer V2 test, the correlation between the intervention and severity of RLS was moderate (Cramer V2 = 0.63). bCramer v2 shows the correlation between the intervention and restless leg syndrome. cCohen d represents the effect size of the intervention on restless leg syndrome while considering their qualitative scoring systems. QRS stands for the quantitative rating system. The aim of this study was to investigate the effect of foot reflexology as a suitable non-pharmacological interaction in reducing the severity of RLS signs in patients undergoing hemodialysis. Russell reported that massage therapy did not reduce the severity of RLS (23). The results of this study showed that foot reflexology could positively decrease the severity of RLS in the experimental group, and a longitudinal study could, even more, improve it. Ozdemir investigated the effect of foot reflexology on fatigue, pain, and cramp and reported that the intervention reduced fatigue, pain, and cramp symptoms in female college students (22). In this study, zones of foot reflexology were not described and no control or placebo group was used for the comparison of results. Wang et al. in a review study reported that reflexology reduced the symptoms of cramp in the interval between two sessions of dialysis in hemodialysis patients (24). Lee et al., in a systematic review study, showed the effectiveness of reflexology therapy in fatigue, sleep disorders, and pain (25). All these studies’ findings were consistent with the current study results and confirmed the positive effects of reflexology or similar techniques on complications of hemodialysis. While the cause of RLS is not clearly known, it seems that the relaxant effects of reflexology can reduce the symptoms of RLS in hemodialysis patients. The small sample size makes it difficult to generalize the findings to all hemodialysis patients. In addition, subjects’ personal differences concerning social, cultural, psychological, and family factors might have affected the evaluation and tolerance of the severity of RLS in the patients. The effect of foot reflexology was assessed only on the symptoms of RLS and other potential symptoms in hemodialysis patients were not assessed. Consequently, it is reasonable to assess the effectiveness of foot reflexology in other signs and make comparisons between foot reflexology and other interventions in future research. The lack of following up the outcomes of foot reflexology in long-term and not evaluating the impact of foot reflexology when the patient was at home or office were other limitations of this study. Due to adverse effects of RLS on patients’ comfort, it is important to find suitable ways for alleviating their symptoms and improving their quality of life. Foot reflexology reduced RLS signs in the experimental group. Therefore, foot reflexology can be used for patients with end-stage renal disease and other types of diseases. This intervention had no adverse effects and therefore, it can be applied in caring for hemodialysis patients. It is simple, inexpensive, and easily applicable and causes no disruption in hemodialysis. Therefore, it is suggested including complementary therapies in the nursing curriculum and in-service and continual education programs. More studies are recommended for evaluating the effect of reflexology on other parts of the body. Foot reflexology can be used as a safe and non-pharmacologic nursing intervention in reducing restless leg syndrome among female patients undergoing hemodialysis. Due to the adverse effects of RLS on patients’ comfort, it is important to find suitable ways for alleviating their symptoms and improving the quality of life. Foot reflexology was beneficial to recovery RLS in hemodialysis patients. Thus, it can be used along with other therapies of RLS in hemodialysis patients. It can help control leg lethargy symptoms, especially in older people. We appreciate the administrators and the participants for their kind cooperation. Authors’ Contribution: All authors meet the authorship criteria and they all agree with the content of the manuscript. 1. Fonseca NT, Urbano JJ, Nacif SR, Silva AS, Peixoto RA, Urbano GJ, et al. A systematic review of sleep disorders in patients with chronic kidney disease undergoing hemodialysis. J Phys Ther Sci. 2016;28(7):2164-70. doi: 10.1589/jpts.28.2164. [PubMed: 27512289]. [PubMed Central: PMC4968529]. 2. Rist PM, Tzourio C, Elbaz A, Soumare A, Dufouil C, Mazoyer B, et al. Structural brain lesions and restless legs syndrome: a cross-sectional population-based study. BMJ Open. 2014;4(11). e005938. doi: 10.1136/bmjopen-2014-005938. [PubMed: 25421338]. [PubMed Central: PMC4244423]. 3. Yeh P, Ondo WG, Picchietti DL, Poceta JS, Allen RP, Davies CR, et al. Depth and Distribution of Symptoms in Restless Legs Syndrome/ Willis-Ekbom Disease. J Clin Sleep Med. 2016;12(12):1669-80. doi: 10.5664/jcsm.6356. [PubMed: 27655450]. [PubMed Central: PMC5155205]. 4. Wali SO, Alkhouli AF. Restless legs syndrome among Saudi end-stage renal disease patients on hemodialysis. Saudi Med J. 2015;36(2):204-10. doi: 10.15537/smj.2015.2.10036. [PubMed: 25719586]. [PubMed Central: PMC4375699]. 5. Rye DB, Trotti LM. Restless legs syndrome and periodic leg movements of sleep. Neurol Clin. 2012;30(4):1137-66. doi: 10.1016/j.ncl.2012.08.004. [PubMed: 23099132]. 6. Chatterjee SS, Mitra S, Guha P, Chakraborty K. Prevalence of restless legs syndrome in somatoform pain disorder and its effect on quality of life. J Neurosci Rural Pract. 2015;6(2):160-4. doi: 10.4103/0976-3147.153219. [PubMed: 25883472]. [PubMed Central: PMC4387803]. 7. Cirillo DJ, Wallace RB. Restless legs syndrome and functional limitations among American elders in the Health and Retirement Study. BMC Geriatr. 2012;12:39. doi: 10.1186/1471-2318-12-39. [PubMed: 22834914]. [PubMed Central: PMC3433378]. 8. Einollahi B, Izadianmehr N. Restless leg syndrome: a neglected diagnosis. Nephrourol Mon. 2014;6(5). e22009. doi: 10.5812/numonthly.22009. [PubMed: 25695039]. [PubMed Central: PMC4318015]. 9. Allen RP, Picchietti DL, Garcia-Borreguero D, Ondo WG, Walters AS, Winkelman JW, et al. Restless legs syndrome/Willis-Ekbom disease diagnostic criteria: updated International Restless Legs Syndrome Study Group (IRLSSG) consensus criteria--history, rationale, description, and significance. Sleep Med. 2014;15(8):860-73. doi: 10.1016/j.sleep.2014.03.025. [PubMed: 25023924]. 10. Buchfuhrer MJ. Strategies for the treatment of restless legs syndrome. Neurotherapeutics. 2012;9(4):776-90. doi: 10.1007/s13311-012-0139-4. [PubMed: 22923001]. [PubMed Central: PMC3480566]. 11. Innes KE, Selfe TK. The Effects of a Gentle Yoga Program on Sleep, Mood, and Blood Pressure in Older Women with Restless Legs Syndrome (RLS): A Preliminary Randomized Controlled Trial. Evid Based Complement Alternat Med. 2012;2012:294058. doi: 10.1155/2012/294058. [PubMed: 22474497]. [PubMed Central: PMC3303621]. 12. 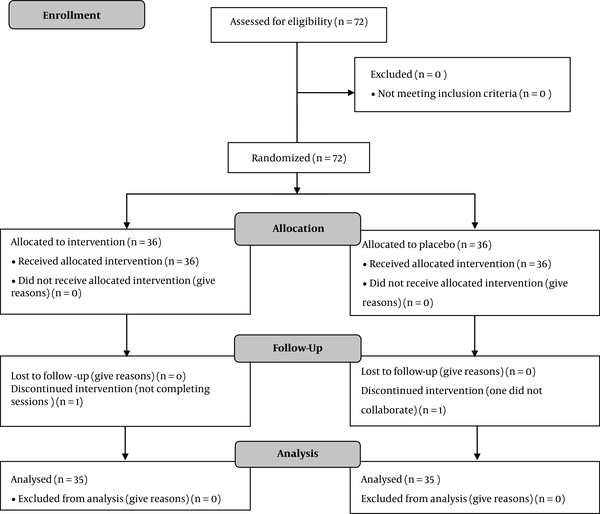 Ghanei Gheshlagh R, Farajzadeh M, Zarei M, Baghi V, Dalvand S, Sayehmiri K. The Prevalence of Restless Legs Syndrome in Patients Undergoing Hemodialysis: A Systematic Review and Meta-analysis Study. Basic Clin Neurosci. 2017;8(2):105-12. doi: 10.18869/nirp.bcn.8.2.105. [PubMed: 28539994]. [PubMed Central: PMC5440919]. 13. Bayard M, Avonda T, Wadzinski J. Restless legs syndrome. Am Fam Physician. 2008;78(2):235-40. [PubMed: 18697508]. 14. Hashemi SH, Hajbagheri A, Aghajani M. The Effect of Massage With Lavender Oil on Restless Leg Syndrome in Hemodialysis Patients: A Randomized Controlled Trial. Nurs Midwifery Stud. 2015;4(4). e29617. doi: 10.17795/nmsjournal29617. [PubMed: 26835466]. [PubMed Central: PMC4733501]. 15. Stephenson NL, Swanson M, Dalton J, Keefe FJ, Engelke M. Partner-delivered reflexology: effects on cancer pain and anxiety. Oncol Nurs Forum. 2007;34(1):127-32. doi: 10.1188/07.ONF.127-132. [PubMed: 17562639]. 16. Byers D. Better Health with Foot Reflexology: The Ingham Method of Reflexology, Recording for the Blind & Dyslexic. St Petersburg: Ingham; 2004. 17. Crane B. Reflexology: The Definitive Practitioner's Manual: Recommended by the International Therapy Examination Council for Students and Practitoners. UK: HarperCollins; 2012. 18. Ruiz Padial E, Torres López N, Luna Bujaldón J, Espadas Villanueva I, Reyes del Paso G. Cardiovascular effects of reflexology in healthy individuals: evidence for a specific increase in blood pressure. Altern Med Stud. 2012;2(1):4. doi: 10.4081/ams.2012.e4. 19. Embong NH, Soh YC, Ming LC, Wong TW. Revisiting reflexology: Concept, evidence, current practice, and practitioner training. J Tradit Complement Med. 2015;5(4):197-206. doi: 10.1016/j.jtcme.2015.08.008. [PubMed: 26587391]. [PubMed Central: PMC4624523]. 20. Nasiri A, Mahmodi MA. Aromatherapy massage with lavender essential oil and the prevention of disability in ADL in patients with osteoarthritis of the knee: A randomized controlled clinical trial. Complement Ther Clin Pract. 2018;30:116-21. doi: 10.1016/j.ctcp.2017.12.012. [PubMed: 29389470]. 21. Habibzade H, Khalkhali H, Ghaneii R. [Study of the relationship between restless legs syndrome and sleep disturbance among patients in critical care units]. Iran J Crit Care Nurs. 2011;4(3):153-8. Persian. 22. Ozdemir G, Ovayolu N, Ovayolu O. The effect of reflexology applied on haemodialysis patients with fatigue, pain and cramps. Int J Nurs Pract. 2013;19(3):265-73. doi: 10.1111/ijn.12066. [PubMed: 23730858]. 23. Russell M. Massage therapy and restless legs syndrome. J Bodyw Mov Ther. 2007;11(2):146-50. doi: 10.1016/j.jbmt.2006.12.001. 24. Wang MY, Tsai PS, Lee PH, Chang WY, Yang CM. The efficacy of reflexology: systematic review. J Adv Nurs. 2008;62(5):512-20. doi: 10.1111/j.1365-2648.2008.04606.x. [PubMed: 18489444]. 25. Lee J, Han M, Chung Y, Kim J, Choi J. Effects of foot reflexology on fatigue, sleep and pain: a systematic review and meta-analysis. J Korean Acad Nurs. 2011;41(6):821-33. doi: 10.4040/jkan.2011.41.6.821. [PubMed: 22310867].